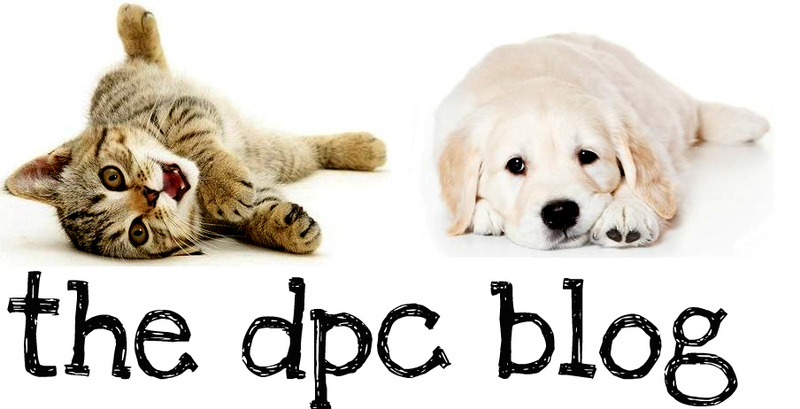 DPC's Blog: Meet Sweet Pea! Sweet Pea is a 5 year-old grey tabby cat who was presented to us on Saturday. 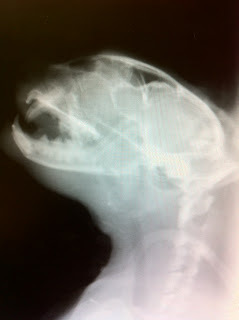 The owner stated that she had a broken jaw and his funds were limited. It was obvious from the beginning that the damage was extensive. Sweet Pea is normally an indoor-only cat but on Saturday she had briefly gotten out and when she returned her jaw was obviously broken, with a piece of bone actually visibly protruding. More than likely during her escape she encountered another animal, and that altercation resulted in this painful injury. Upon arrival it became apparent that she was in intense pain. Our staff immediately got a doctor and began diagnostics. Sedation was necessary as she was too painful to treat without it. Radiographs were taken and the doctor observed that the fracture was quite severe, the alignment of the entire jaw had been compromised. Surgery was going to be absolutely necessary in rectifying the issue. Finances became a concern and so we admitted Sweet Pea and maintained her on intravenous fluids, as she was too painful to even satisfy her basic need to eat. Who could, with a broken jaw? We kept her on pain medication and eventually a feeding tube was placed, as it was the only way we could ensure she received the nutrition she needed during this painful ordeal. The wait then began for the funds to become available to perform the procedure. A surgeon our facility works with frequently was notified, and shown the x-rays to ensure that the surgery could be performed at our facility. He confirmed that it was within his capabilities and today he traveled to our clinic to perform the needed procedure. The surgery took one hour, but things were looking good! 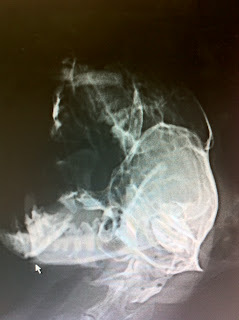 Following the surgery, another radiograph was then taken to confirm the proper placement. Sweet Pea was then recovered from anesthesia and we determined that observation overnight would be needed. At this time the feeding tube is still in place (syringe feeding will soon be needed, and the tube will be removed) and Sweet Pea is not urinating on her own and will need her bladder expressed periodically. For this reason, we have transferred Sweet Pea to a 24-hour emergency facility. The owner has already picked up and is on her way to the emergency facility. Tomorrow Sweet Pea will return to us for continued care. Below are some before & after radiographs of the jaw. Before - Look closely and you can see that the right side of the jaw is obviousy broken with a section of bone protruding forward. The entire area of the jaw was gaping open and disconnected. After - As you can see the alignment of the lower jaw on both the left and right side are stable and consistent with the upper jaw. This was achieved with nylon suture material, which will, I believe, stay in place permanently in place of the shattered and missing section of bone that would otherwise have anchored the fractured area of the jaw into place. We ﻿will continue to update you on Sweet Pea's status as she continues her road to recovery!